My site offers the widest range of search opportunities when you begin to look for a new home. Start with My Listings to get a taste of some of the top properties I have in my personal database. 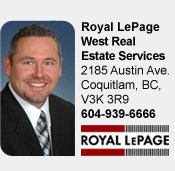 Then search the listings currently available for Port Coquitlam. Or, broaden your scope and explore the Multiple Listings Service (realtors.ca) to view homes for sale by all real estate agents throughout Canada. Whatever search option you explore, let me help you navigate. If you find a home that seems like a fit for you, simply click on the Inquire About Listing button inside its Listings Detail page. Fill out your contact info and let me do the rest. I'll be in touch shortly with more information and schedule a tour of the home if you wish. I'll help you every step of the way!